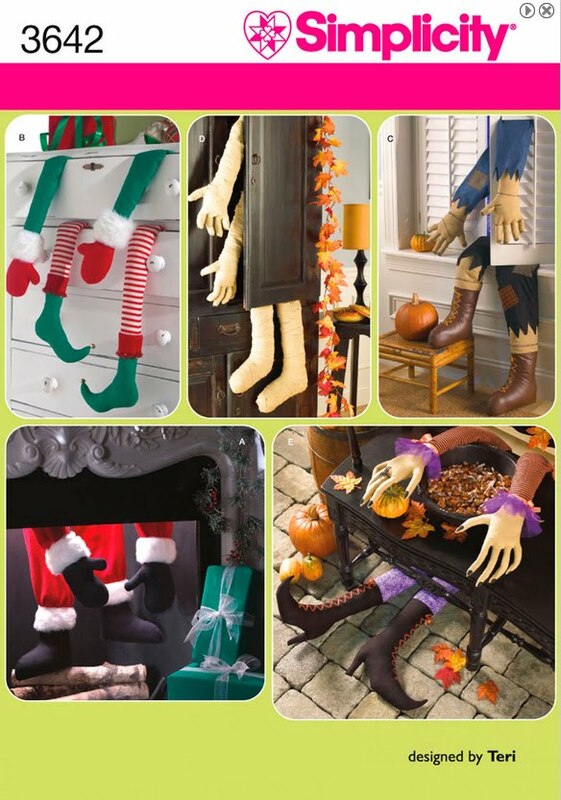 Today's creepy pattern Simplicity 3642 "Seasonal Decorations" although I think an ebay listing for this pattern is on the right track with the title "witch mummy elf Santa legs home decor". Yes indeed that's what you're getting her folks, arms and legs....For Halloween I think it's rather cute, those witch hands and feet are awesome! The mummy is just so so but Santa? OMG and the elf? What crime scene did we just walk into here? This pattern is in print and available for purchase, don't miss your opportunity to own one of Simplicity's finest! 5 comments :: Body parts? I'm a court reporter sitting in court right now, and that was the first thing I thought -- crime scene! Oh, that is just too weird. Thank you for sharing. I needed a laugh. OMG is right. I think they're all creepy (though I agree, the witch's hands look amazing), but Santa takes the cake. "Scare all your holiday guests, especially the little ones, with this adorable pattern!" Also love the pink Simplicity heart and logo at the top of the envelope, to "soften" the pattern. A video every now and then is really great and postings like this in between is also great. It is not either quantity or quality, mehinks. You're back! You're back! Glad all is well!